October | 2016 | #Hope lives! The good news is that the US Gross domestic product, a broad measure of goods and services produced across the economy, expanded at an inflation- and seasonally adjusted 2.9% annual rate in the third quarter, the Commerce Department said Friday. It is good that our economy is growing and credit goes to President Obama who brought us back from the brink of the Great Recession, into continued growth in employment and exports. Energy rich America is looking a lot stronger, and can afford to spend more on its infrastructure, to provide even more investments and employment. The bad news is that Hillary Clinton’s supporters expect her to carry on progressive policies, for the US economy and trade. She will push Federal policy makers to bring their long-term fiscal house in order, invest in infrastructure, and enact policies that make America a great place to do business. Hillary, May and Angela will make the new alliances, post Brexit and TPP. We can hope to return to a time, where higher productivity will also raise median incomes, and average salaries will rise higher. We could raise the living standards of the middle class tremendously, by just increasing hourly compensation, and steadily increasing productivity. In fact wages should grow faster than inflation for quite some time, as the economy continues to expand, driven by cheap energy. We need to spend money to create an educated population, pools of skilled labor, have strong investments in infrastructure, and greatly increase basic R&D. To lead the emerging innovation economy, we need massive amounts of clean energy, computing power and technology. In the SMAC revolution, massive investments need to be made, and trillions to be gained from the new economy. Productivity as I describe it, is the art of making something out of nothing. It makes the middle class and the rich richer, while lifting up the poor. Electric cars, green energy, smart cities, eco living will all transform our future, at a faster rate than in recent years. 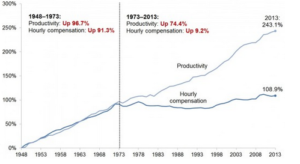 The relative stagnation in hourly compensation since the time of Carter is due to the new progressives, who took over from the greatest generation of leaders. 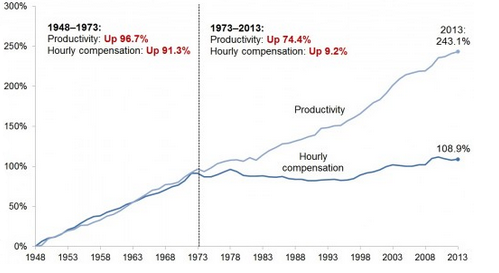 American inequality has gone through the roof, in these years as the rich have just gotten richer. The top 1 % earned most of the income and the bottom 50% made a pittance in comparison. Wealth inequality grew tremendously in the past decades. Wide spread poverty in Asia, Africa and the Middle East is talked about, but the hidden poverty in America is growing. There are more people falling through the safety net, as the economy progresses and there is a resentment, that things are not as good as they appear. Clinton can reverse the “WELFARE STATE FOR THE 1%, by ending welfare for the poor, attitude,” which her husband glorified. Instead she has to spread the safety net, and start a virtuous self-sustaining period of rapid productivity and wage growth. The aim is more and better employment, and the solution is Infrastructure and alternate energy spending from the Government. The Private Sector will also expand on the back of a growing middle class as less income equality, means more demand for goods and services. Business and government must combine their efforts to take steps to build a skilled workforce, ready to do tomorrow’s jobs. Massive R & D will, upgrade local suppliers, foster innovation and reinforce education. The productivity gains enable firms in the U.S. to win in the global market place, while also help in creating jobs, which lift living standards. The government and business need to work hand in hand, to more equitably distribute the fruits of productivity. We need to return to the policies which encouraged a more evenly distributed income, as seen in the chart from 1948 to 1973. Median wages and productivity rose together, to make the great middle class of US consumers, who in turn drive our economy forward. In 2017 we will have a new president, a new vision and a growing GDP. Happy Diwali and wishing a very prosperous and healthy year ahead, to everyone! Photograph: Olaf Oliviero Riemer of a king vulture found in SA. When I saw this vulture I saw nature in new colors, as it is truly a wonder of evolution. Life exists in so many different hues and shades, that I am constantly amazed, at all the sight of such creatures, in our universe. Each of us satisfies some need of nature, and just as we have discovered, in the return of the wolves in Yellowstone, that even predators like vultures, play a key role in evolution. Each of us has certain characteristics and natural traits, sense organs, and cognitive capabilities, endowed by nature. We each use our sense organs, for our personal gain, and yet through nature’s laws somehow, achieve harmony on earth. The lioness is on the hunt, and few will stand between it and its goal, yet the wildebeest flourish. The vulture will feast this week again, as he has done from time immemorial, on the carrions that nature provides. I throw open my gates, and let the king of birds in, and he feasts to his delight. I awake to a flight of nothingness, yet strangely satiated, and soar on the wings of the vulture, into the high heavens..
“I’m not the one you want, babe/I’m not the one you need.” Sang the bard of our generation, and I fell into a swoon, as suddenly it meant saying goodbye to all meaningful relationships, by walking away from the window. The window of opportunity is to find our very soul, to above all be oneself, as this journey is, to first find oneself. Bob gave up writing for us people, a long time ago, and withdrew into his own, personal existence and wrote what he wanted. In the meantime, I grew old and find that the times, they are a-changing, and it is time once again to sing Lay Lady Lay, to one’s beloved. Life became a ride on a magic carpet, following a Tambourine man, who played our song, and in the jingle jangle morning, was our only friend. From their it progressed into years of work, for a living and survival, and one forgot the rainy day woman. 52 years after Sartre’s refusal the Swedish Academy has awarded the prize to a man, who has done one better, by refusing to acknowledge their prize or their existence. 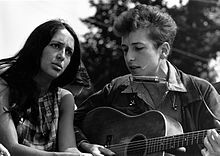 One member of the Academy has called Mr. Dylan’s behavior “impolite and arrogant.” I guess that Bob has been called considerably worse, during his long and productive career. He single handed seemed to understand the soul of folk, and American music instinctively, and wrote for our generation. There has not been a more important songwriter, and I believe he influenced me even more, than Lennon and McCarthy. Above all else we are temporal and spatial beings, meaning that we live in a time and a space. All our perceptions of the world around us are based on this time and space, at this moment. All things that we see in this time and space, have their own reality, and we perceive them through our sense organs. We are also intuitive beings, and perceive things around us; as if they have an existence, beyond current space and time. We can only know about the things around us, based on our intuitive ability. The more we grow our intuitive ability, to see our space and time relationships, by moving beyond them, into a new reality. The more we will learn about the world around us. First we must come to know our own Atman, before we can grow our intuitive knowledge through Om. Copernicus forever changed our perceptions about the planets and the space around us. ‘Copernicus revolutionized astronomy by taking the position of the observer into account.’ From then onwards we noticed the movement of the stars, in relation to the viewer’s perception. Our whole universe changed, as we gazed at the heavens, as space slowly emerged; as eternal and endless, as our knowledge grew. Time also is eternal, and we are fooled into thinking, that Time and Space are our only reality. In fact they too, like the stars above, are transcendental, and we have to seek knowledge beyond them. The things we observe are independent of them, and in fact we are in a world of ‘Maya’, or a not properly perceived transitory world. As the knower is not knowledgeable, he\she cannot understand all that he\she is experiencing, at a given place\time. As we cannot know completely, until all our capabilities are enhanced, the knower limits his knowledge, based on his intuitive capability and reason. Our attachment to this gross world, limits our world of reason and knowledge and we stray from our Atman. The growth in this consciousness is required for mankind to prosper. We have pondered on these questions for millennia in India, and the Upanishads and the scriptures of ancient Hinduism paint a far different reality. Thousands of year’s ago the students sat at their master’s feet, and explored the meaning of our existence. Human existence is unique and the quest for our reality in a dream\sleep\awake state troubled the sages greatly. We exist in a fourth state (atman) they realized, and it is this conscious being, who is observing the one, in the dream\sleep\awake state. We have to grow our consciousness to improve our intuitive understanding of reality. Reason and knowledge point to a knower who is evolving into a conscious being, and therein lies our future. We have to learn to learn again, and become that knower (atman), who transcends the past, present and future (Om). . It is only when objects around us become part of our knowledge, that existence happens. Only when we are conscious, does consciousness and reality exist, in its base form. Yet we are limited in this existence, as we know so little, and we all share so much hope, for us to grow. Humanity has built a great need, for knowing more about our existence. Our reality is questioned and we still must maintain our hope, in our future, if we are rational beings. Idealists also use time to their advantage, saying things will get better over time. We can enjoy the present and live life to its fullest, as all constraints have been removed. We are free to become a knower, and be happy, and seek Nirvana. The fourth state (atman) is neither born or dies, and it is neither the dream nor the reality, nor the deep sleep. We are all that, and these objects we see, are not real. When we come to know that reality, we are already transcended beyond it.. Awaking all our intuition is why we have this life, and those who rise from its shadows become the knower (brahman). Live now and be aware of our universe and existence (atman), and we will become free to explore beyond our temporal and spatial world (brahman). We bid farewell to Obama with the happy news that 3.5 million Americans from every demographic group benefited from a stronger economy, and an expanding job market in 2015. Poverty levels is a State phenomenon and Mississippi leads with 22% living below the poverty line, followed by some more red states with Trump supporters. Tiny NH has the lowest rate of 8.2% and the worse states are still in their teens, despite the growth of the last seven years in employment. Income inequality is not only an economic problem, but it is also a social and political problem. America has to grow its way out of its problems and for that it needs good policies and budgets. The middle class should grow to lift more people out of poverty, in the new welfare state (post the first Clinton as a lot of the safety net is gone). Blacks and Hispanics who account for more than 45 percent of those below the poverty line of $24,300 for a family of four in most states — experienced the largest improvement in 2015. Unfortunately over 24% Blacks still live below the official poverty line and over 21% for Hispanics and while it is a low of 9.1% for whites, they have benefited greatly last year from the reduction in poverty; due to economic development, and low gas prices. About 43 million Americans, more than 14 million of them children, are still officially classified as poor and have no safety net in the richest nation on earth. 2.9 million more jobs were created from 2014 to 2015, helping millions of unemployed people cross over into the ranks of regular wage earners. Millions worry about their family’s financial security on a daily basis providing support to such candidates as Donald Trump. If Republican policies are so much better than the democrats then Mr. Trump will lead the Red states finally out of their poverty, in his speeches. I fear in reality, he will perpetuate the disaster of future inequality, with his policies and actions like lower taxes for the wealthy. The benefits of the growing economy finally translates to higher income and jobs for the High School dropouts, High Schoolers and part college lowest rungs amongst wage earners are finally seeing change. The new jobs being created are helping the poorest and millions more have Healthcare under the new Accountable Care act, for the first time in their life. Majority of these benefits have gone to lift old people and young under 18 across the country out of dire poverty. We have to continue to make progress in helping these working poor, to live an honorable life. We are on the right track and everyone deserves their dignity..